According to a SkyTruth volunteer based in Brazil, the vessel involved in this week’s spill is the tanker Elka Aristotle. 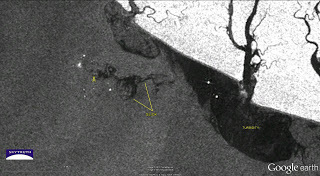 And according to a handy vessel traffic site she recently stopped off at “Campos Basin P38” which appears to be an FPSO in the Marlim Sul field of the Campos Basin. Check out this excellent, well illustrated and very detailed summary of the Marlim Sul field discovery and development, including the role of the P38 FPSO. So this spill was most likely related to routine FPSO operations. Something to look forward to soon in the Gulf of Mexico. 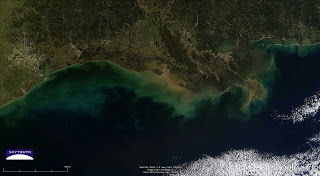 Thought we’d share this stunning satellite image of the Gulf, shot today by NASA’s MODIS satellite. Enjoy! 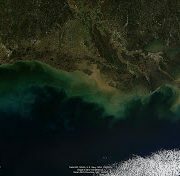 MODIS/Terra satellite image, Gulf of Mexico – January 27, 2012. 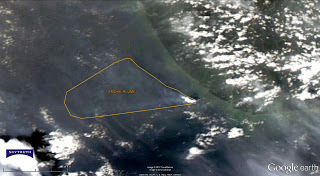 Image courtesy MODIS Rapid Response Team. 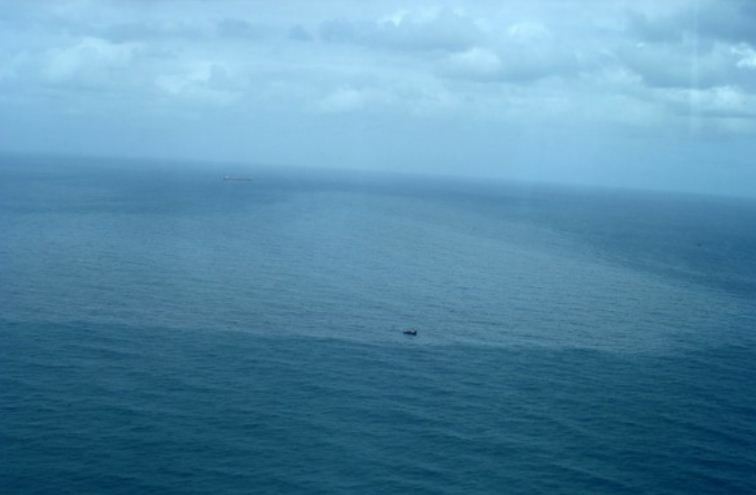 Brazil Suffers Another Oil Spill – Another Warning Shot For FPSOs? 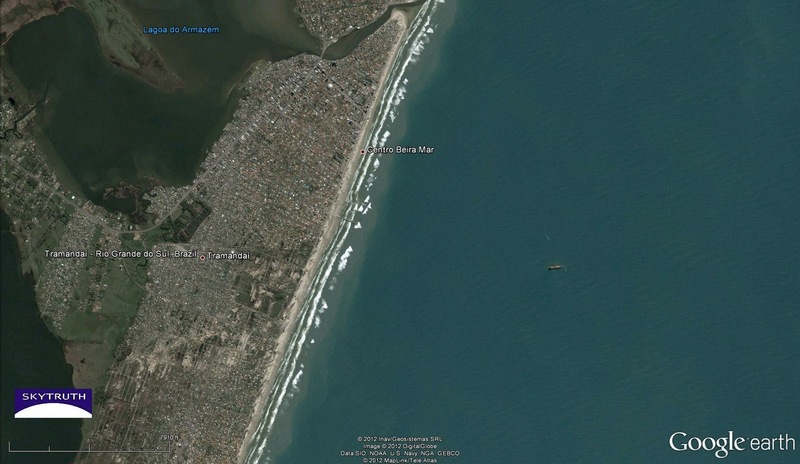 Brazil just experienced another oil spill, this time close enough to shore that it has fouled a stretch of beach in Rio Grande do Sul. 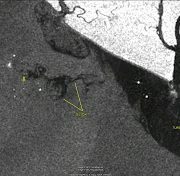 The spill apparently happened while a tanker was offloading a cargo of oil at the Osorio terminal operated by Petrobras, near the city of Tramandai. This spill is reminiscent of Shell’s recent spill off Nigeria caused when oil leaked from a cracked transfer line between an FPSO and a shuttle tanker. 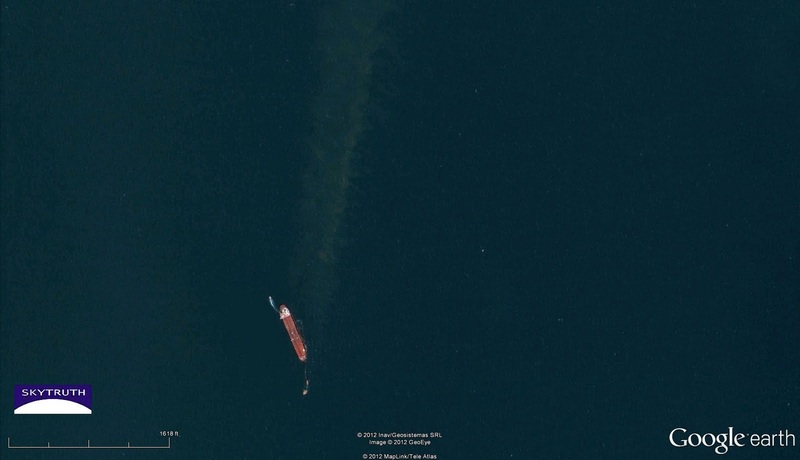 It’s possible this Petrobras spill happened at the other end of an FPSO operation, where the shuttle tanker was offloading its cargo to a coastal facility. This is a concern, since FPSOs are now being used in US waters in the Gulf of Mexico for deepwater oil development — and Petrobras, the world leader in FPSOs, has already had a serious failure at the first FPSO installation under construction in the Gulf. 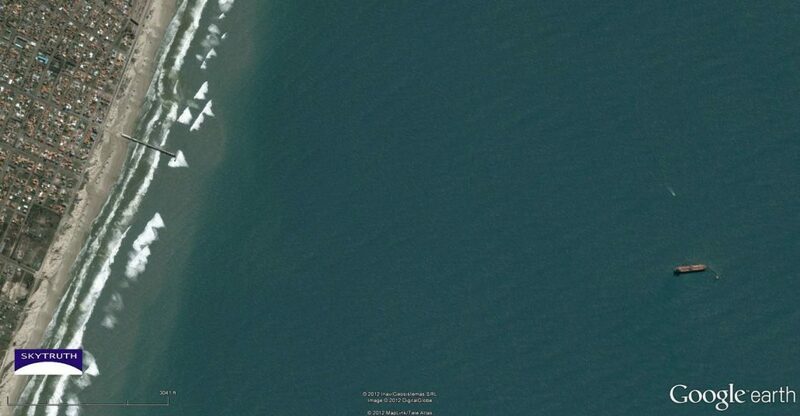 Oil slick from spill that occurred at an offshore terminal near Tramandai, Brazil on January 26, 2012. Photo courtesy World Maritime News. We thought we’d give you a closer look at the Osorio terminal, an offshore loading facility. 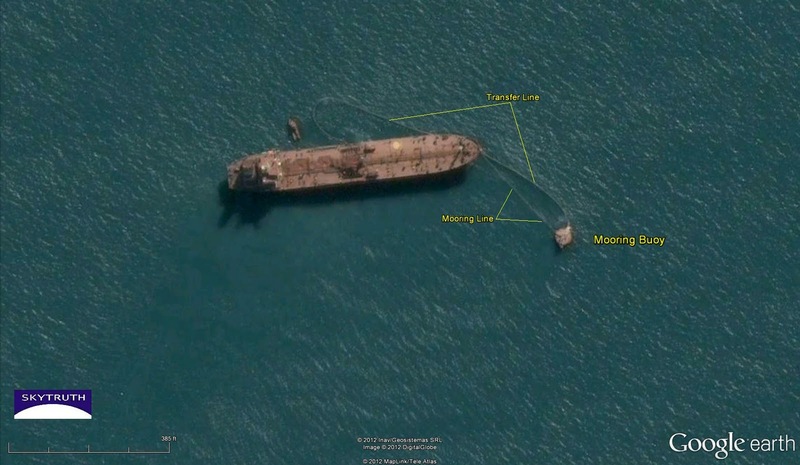 The latest Google Earth imagery (March 2010) is cloudy in this spot, but if you use the “view historical imagery” feature you can toggle back in time to cloud-free high-resolution images from October 2009 and April 2005 that clearly show the facility in use, with tankers moored at the loading buoy about 2.2 miles off the beach. 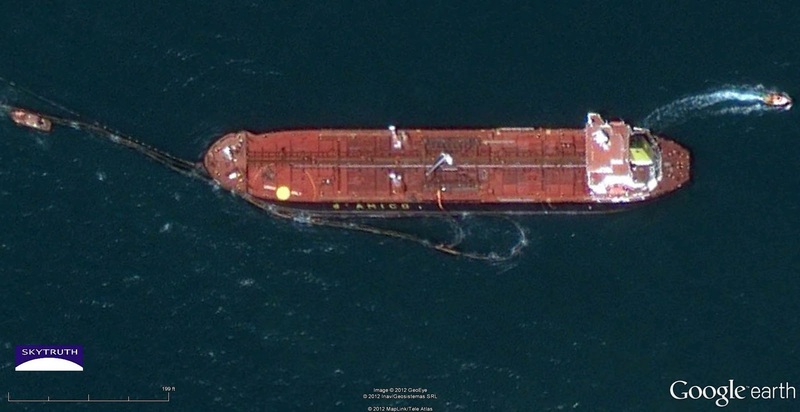 Zoom way in and you can actually read a name on the side indicating this is a tanker operated by d’Amico Tankers Ltd.
/wp-content/uploads/2016/08/test_logo.png 0 0 John Amos /wp-content/uploads/2016/08/test_logo.png John Amos2012-01-27 21:22:002019-02-21 09:35:59Brazil Suffers Another Oil Spill - Another Warning Shot For FPSOs? 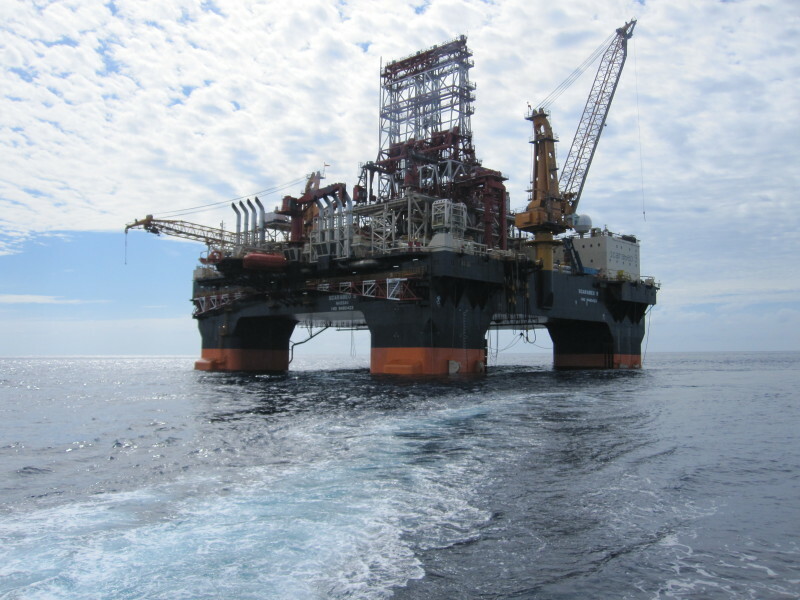 Say hello to my little friend: Scarabeo-9 arrives to begin deepwater drilling off Cuba. Photo courtesy Shipspotting.com. The Scarabeo-9, a big semisubmersible drill rig owned by Italian company ENI, just built in China, and currently under contract to the Spanish oil company Repsol, has arrived in the Florida Straits off the north coast of Cuba to begin exploratory oil drilling. The rig will begin its work in exploration block N27 (see map after the jump) just 90 miles from Key West, in water about 6,500′ deep. That’s 1,500′ deeper than the site of the BP / Deepwater Horizon spill in the Gulf in 2010. 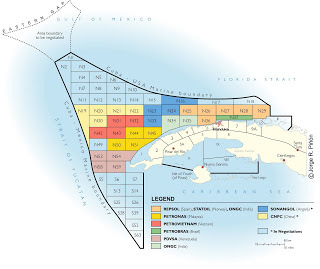 Map of offshore oil and gas exploration blocks in Cuban waters. 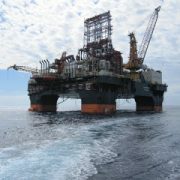 Scarabeo-9 rig will be drilling soon for Repsol in Block N27 in Florida Straits, about 90 miles from Key West. Map courtesy Cuba Standard. The rig passed an informal US inspection while it stopped over in Trinidad on its trip here from China, and Repsol has voluntarily agreed to comply with to US “environmental requirements” related to offshore drilling (whatever that means). But Floridians are concerned that should a major spill occur, wind and current could push oil into US waters and potentially on to southern Florida islands and beaches that dodged a bullet during the BP / Deepwater Horizon spill. Making matters worse, the US trade embargo against Cuba prohibits US spill-response companies and oil companies from providing assistance unless they’ve received a special license from the State Department. Only a few firms have been licensed at this point — representing only about 5% of the spill-response capacity that was thrown, with minimal effect, at the BP / Deepwater Horizon spill — but that’s not going to stop the Scarabeo-9 from making hole. On the hook for a rig-rental fee of more than $500,000 per day, Repsol is unlikely to keep the Scarabeo idle while we get our act together. Time is big money in this capital-intensive business. We’ll be monitoring this area, too, using satellite images. We’ll publish here when we get our first image showing the rig on location.